1217 - REDWOOD NATIONAL & STATE PARKS - 3" round - iron-on backing. Patches are carded to hang on a display rack for retail stores. YOSEMITE-61 - YOSEMITE indian chief souvenir embroidered patch. 3". 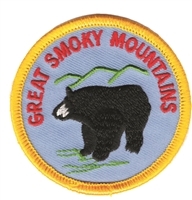 Patches sew or iron-on & are carded for a display rack for stores.